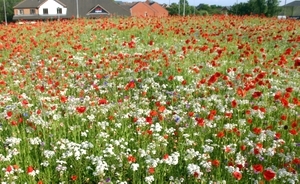 Many people would like to create a wildflower meadow in their garden. But current usage of the words 'wild flower' and 'meadow' in seed catalogues, gardening books and on TV is inconsistent and can be confusing. Before planning any sort of meadow in your garden you need to understand the different options open to you. 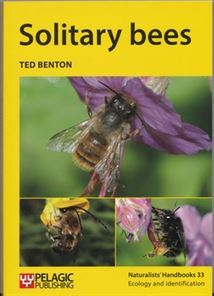 On this page I explain the difference between the three scenarios which sometimes get called 'meadows', and give my opinion of their value for pollinators. I also discuss What are Wild Flowers and I recommend some good sources of further information which you can use if you decide to create any of these options in your own garden. These are large flowerbeds and sown areas of colourful annual flowers. They are analogous to cornfields in traditional farmland. They are not meadows in the strict sense and they do not necessarily contain 'wild flowers'. 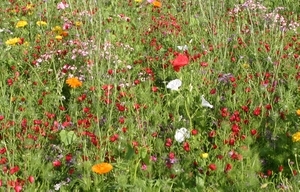 Various ‘pictorial mixes’ or 'meadow mixes' of annuals from around the world are available and are now widely used by local authorities, by urban roadsides, on roundabouts and so on. Annual flowers originally evolved as weeds of disturbed ground, and typically grow very quickly, flower and die in one season. They do not grow in grass. Their plot will be bare in winter and must be re-cultivated and re-sown the next spring. They must be hand-weeded, as coarse annual weeds follow the same growth pattern. Typical flowers in these mixes may include the scarlet Field Poppies, blue Cornflower and yellow Corn Marigold, plus annuals originating in the USA and Mediterranean areas, and sometimes horticultural hybrids of hardy annuals such as Godetia and Clarkia. The value of annual mixes for pollinators is the subject of debate and research. 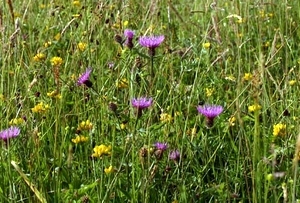 Although they are better than mown grass, recent research suggests that perennial meadows, as described below, provide significantly more forage for pollinators. In particular see Hicks et al 2016. This consists of grassland containing perennial wildflowers. Such areas are analogous to the hay meadows of traditional farmland. Once established such an area can be maintained like a hay meadow, being allowed to grow long in the summer months so that the wild flowers will bloom among the grasses, then being cut in late summer. In a garden situation the hay should be cut in September, to allow insects to complete their life cycles. 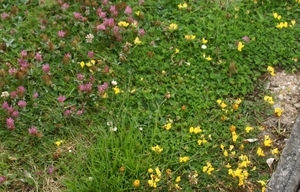 During the autumn and winter it is mowed just like a lawn and the clippings must be removed. Such sites are difficult to establish in garden situations, as they require a poor soil, low in nutrients. Rich topsoil should be stripped and you should sow into poor subsoil. This does matter, I'm afraid. Seeded mats are now available and can be used instead of hand broadcasting the seed. 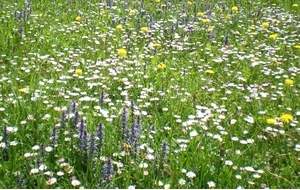 The young meadow require patience, careful management and extra mowing in the first 2-3 years after sowing, to ensure that the young perennial flowers become established and are not swamped by grass or weeds. Hand weeding may also be necessary in the very early stages to remove any fast-growing coarse weeds. If you have a starved old lawn or grassy area made of fine grasses (not vigorous Ryegrass) an alternative approach is to buy 'plugs' (small plants) of suitable perennial wildflowers and plant them directly into the grass. Maintenance is just as described for an established meadow grown from seed: mow in autumn and winter, leave uncut from March to September. Whatever method you use to establish the hay meadow area, sowing seeds of the parasitic wild flower Yellow Rattle (Rhinanthus minor) into newly-mown sward in early autumn can help reduce the vigour of grasses and give the flowers more room to grow. Red Clover, Bird’s Foot Trefoil, Knapweed, Scabiouses, Wild Marjoram, Betony and various Hawkweeds all thrive under this type of regime. These are the plants you need - check that they are in your seed mix. Ox Eye daisy may also be included but can be over-vigorous at first and swamp the other flowers, and you may need to weed it out by hand. I do not recommend using it in hay meadow seed mixes. The value of such sites to pollinators can be very high as these grassland wildflowers will provide forage for a diverse range of insects. Several species of moths and butterflies also breed in this type of habitat. 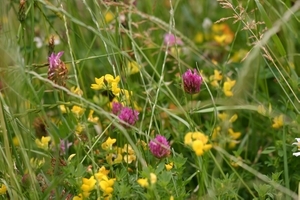 See 'where to get more information' at the foot of this page for sources of more detailed advice about creating a hay meadow habitat in a garden setting. This approach consists of a garden lawn that is fairly regularly mown during the summer but with the mower on a high setting, allowing room for low-growing perennial lawn flowers to survive the cut below the blades. Some flowers will be lost in each cutting but they soon grow back. This situation is analogous to pasture (i.e. grassland grazed by animals) in traditional farmland. This approach also works best on starved, low-nutrient lawns, preferably old lawns with fine grasses. It is unlikely to work on lawns on rich soil, or that consist mainly of vigorous Ryegrass hybrids. The advantage of this approach is that it is easy and not disruptive - you don't have to dig up an area and re-sow, and you can use such areas for sitting out or for kids to play on, which is not possible in Summer with the ‘hay meadow’ approach. The wild flowers may already be growing in the lawn anyway, if not you can insert wild flower plugs into the sward, a described above. Red Clover, Bird’s Foot Trefoil, Self-heal and Hawkweeds are low-growing and will thrive under this type of regime, and should be encouraged. Knapweed and Ox Eye daisy are taller and not so suitable as they tend to be chopped by the cut. The value of such sites to pollinators can be fairly high as these wildflowers will provide forage for a diverse range of insects, especially small solitary bees. White Clover also thrives under such treatment but is not so desirable as the flowers mentioned above, because it tends to increase the soil fertility level and become dominant and the expense of other flowers. Creeping Buttercup, which thrives in damp fertile soil, can also become dominant in such situations and has only limited value to pollinators. What are 'Wild Flowers' ? There is no legal definition of 'wild flower' and when you buy packets of 'wild flower' seeds from garden centres or supermarkets you could be getting the wild flowers of another country, another continent even. I recommend that you avoid the unpredictable 'wild flower mixes' sold in colourful packets and go for something more suitable from specialist, reputable wildflower seed suppliers such as Emorsgate Wild Seeds or Scotia Seeds. All the scenarios that I discuss on this page refer to garden settings or urban parks. If you plan to sow wild flower meadows or wild flowers of any kind in open countryside away from gardens then different criteria apply and you should seek advice concerning seed sources from your local wildlife trust or a similar local conservation organisation. In these circumstances provenance becomes important, and is considered desirable to sow seed of local provenance in order to preserve the genetic integrity of your local flora. This is a botanical rather than a 'pollinator' issue, but it is an important one. The Royal Horticultural Society (RHS) has published useful Guidance on the use of the term ‘wild flower’ in horticulture. If you want to create any of the planting scenarios I mention above in your own garden, or indeed a variation of them, a most useful, concise, and inexpensive source of detailed instructions is a booklet called 'Making Garden Meadows' by Jenny Steel (Brambleby Books, 2013). The author is a well-known writer and educator and her advice really does work. Another good source is 'RSPB Gardening for Wildlife' by Adrian Thomas. (AC Black, 2010). Two separate chapters 'Making a Wildflower Meadow Home' and 'Making a Cornfield Home' discuss this subject with step-by step instructions. If you want to delve deeper into the history and ecology of wild flower meadows please see the books about this subject on my Recommended Reading page.